This is the first of two collabs that Flyindreams and I are doing together. Everything in the wall was done by hand, with a few textures overlayed lightly for effect. We started out by brainstorming and then Flyin did the outlines for Sakura. Then we switched off and I colored her. Tossed it back to Flyin for the bg sand, wing statue, and clouds (kudos to her for the wings and desert idea!) and then I finished off the blending and some painting. It's pretty different than what we started out with, but I think the result is beautiful and really fits Sakura's pose. Check out both of our website for more resolutions! Enjoy! I < 3 Anya. This is the most kickass wall that I've worked on in a long time, and it couldn't have happened without our collabing efforts, so I'm damn proud of the end result! This whole wall started because of the collab contest at ILD, which gave me a great excuse to pester Anya to collab with me. It's kind of dead, but I'm still really grateful for the opportunity to work with (and get to know) a lovely waller like Anya. Also wanted to submit this as 11. Memory, for the 100 Themes Project @ Instant Noodles. The vectoring is awesome and the coloring is fab! Great job, you two! Already commented on Ap,yet I 'd like to say again that I love this wall and I reli love wide-screen walls,it looks neat on my desktop! ah! a nice yet very soft feeling! plus its colors the Wing ruins is also great! love the textures and the bricks. the outlines and also the coloring! its almost a painting! Love the collab work and the concept of the whole wall! double love for the widescreen versions! I like how simmery the sand is, it looks really soft. And ah, the clouds, how soft they look too..
Aw, so beauiful. Nice colouring, everything fits together well. Good composition. Nice render. Great color use. it's so beautiful! and the colours are so great! it;s a lovely wallpaper! I really like it! 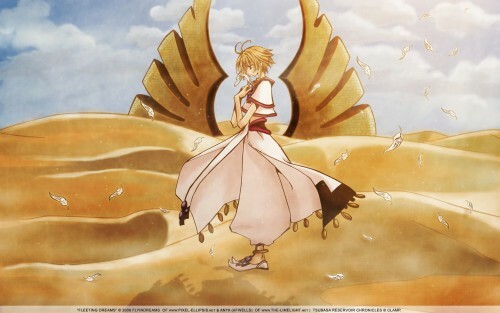 sakura en la ruinas del pais de clow!